In a remote corner of Iran, engineers are working round the clock to return the country to the top ranks of global oil producers. The region of Southwest Iran boasts more proven reserves of oil than Africa's largest producer, Nigeria, and its 60 billion barrels are central to Iran's ambitions. 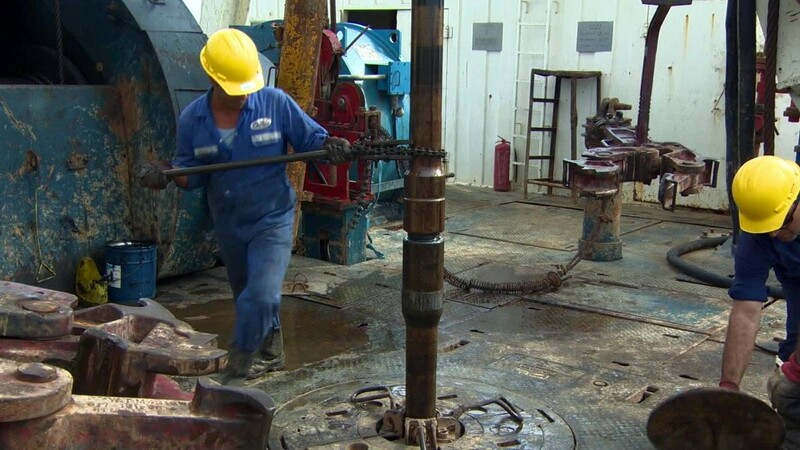 Drilling is nearly complete in the biggest of the region's five fields, called South Azadegan. But it's been an uphill struggle, thanks to years of Western sanctions. CNN was the first foreign TV crew allowed into Iran's largest oil find in 30 years, in the marshlands of what was a battleground in the 1980s war with Iraq. Iran's oil industry has had to get creative to survive years of isolation -- the equipment is old, rusty and in some cases improvised. On one platform, the National Iranian Oil Company is using a Chinese built rig but with American technology at the core purchased before sanctions took hold. Mahmood Marashi, a project manager educated in America, cannot wait for the day Western-led sanctions are removed, and Iran can re-enter the global market. "We hope that after the sanctions are lifted we can move faster," Marashi told CNN. "Of course the quality is very important," he said, in reference to the tools he is now forced to use. Not far away, a new oil handling facility is going up, but with pile drivers that are clearly from a different era. Black smoke billows from the old machinery. Crews are working flat out, hoping to quadruple production in the West Quroon region to a hefty 700,000 barrels a day in 2020, from just 160,000 today. Project managers are required to provide progress reports every two weeks to oil ministry officials, eager to ensure strict deadlines are met. West Quroon makes up more than a third of Iran's proven reserves of 157 billion barrels, the fourth largest in the world. . Abdulreza Hosseinnejad, managing director of the National Iran Oil Company, describes the region's potential as "massive." "We have to work hard in order for it come to reality," he admitted. "We are used to hard conditions -- I hope that after sanctions that life will be much easier." Oil minister Bijan Zanganeh will present his plan for Iran's return to world markets to fellow OPEC members in Vienna on December 4. But he gave CNN a preview of his game plan during an interview in Tehran. As soon as sanctions are lifted, Iran will ramp up production by half a million barrels a day immediately, adding another half million by the start of Iran's fiscal year in March. A further half million barrels will follow by the end of 2016. This would take daily output back up to 4.3 million barrels, matching a pre-sanctions high hit in 2008 and challenging Iraq as OPEC's second biggest producer. Iran would rank in the top five producers in the world, but well behind the big 3: Saudi Arabia, Russia and the United States which each continue to pump out between 9 and 10 and a half million barrels daily. "We are one of the oldest producers in the world, the oldest producer in the Middle East. Can we lose our share in the market? It is not fair," Zanganeh said, alluding to the pressure domestically to regain what it gave up during the sanctions regime since 2007. His deputy for international affairs, Amir Zamaninia, points to a map in his office with large green circles for oil fields and even larger red ones indicating gas finds. "All of these need to be developed. We need more than a few major companies to partner with to develop these fields," said Zamaninia, "What we need is capital, technology and to some degree project management." The ability to attract international oil companies will depend on how generous Iran is prepared to be when it unveils 50 oil, gas and petrochemical projects worth $185 billion later this week and again on a road show to London in February. Contracts running for as long as 25 years, with favorable production sharing rights, may be on offer, Iranian sources said, with the first deals likely signed by the close of the first half of 2016. Related: Epic oil glut sparks tanker "traffic jams"
There's been no shortage of interest, with more than a dozen country delegations from Europe and Asia -- often including energy CEOs in tow -- beating a path to Tehran since the interim agreement was signed July 14. Iran's reemergence as a world oil power will clearly tip the balance within OPEC, and its ambitious plans may force Saudi Arabia to make way for its arch rival. The Kingdom seized Iran's market share during the height of the sanctions in the past three years. "If the Saudis decide to change tack, all they have to do is to take one to one and a half million barrels a day from the market and the balance will come back, said Fereidun Fesharaki, chairman of the consultancy FACTS Global Energy. He believes Iran will try to avoid flooding the market, while proving to the world that it can build up capacity to nearly six million barrels a day by 2020, but whether OPEC players will be willing to adjust their output to accommodate Iran remains a big unknown.